Suffering from a disability might have its drawbacks, but if you get a mobility scooter there are many things you can still do just as good, like traveling. Traveling is a luxury you can still enjoy and splurge yourself with. There are numerous of different models available. So no matter what type of transportation you prefer to use during your travels, whether it be public transportation such as the subway or a bus, or if you want to go further with a train or airplane, there is a travel scoot that fits the bill. What sets a travel mobility scooter apart from an ordinary one? There are both minor and major differences between a normal and a travel mobility scooter, the latter being more suitable for taking with you on your travels. Here are some of the main differences between them so you can understand why going for a travel-friendly model is a must for your trip. Lightweight so that you can carry, load and unload your scooter on your own A very important factor you should take into consideration when you start to look around. They are smaller. If you tend to use public transportation such as bus or subway on a somewhat regular basis you would want it to be small enough to simplify the whole process. Battery power and safety need to be a top priority. Make sure that the battery is airline approved and goes in line with the regulations of the Federal Aviation Administration (FAA). If it doesn’t then you won’t be able to take your scooter with you on airline travels. For more information about the rules and regulations, read our guide on how to travel by air with a mobility scooter. Good folding is a must. No matter if you’re just going on a cruise or flying across the continent, having an easy to use folding-system in place on your scooter will definitely make your life a lot simpler. If you feel that folding the scooter manually could be too much for you, don’t worry. These days there are a lot of mobility scooter models that comes with electric automatic folding so you don’t have to o it manually anymore. Simple is better when it comes to traveling, a portable medical scooter is the best choice. Don’t complicate things by getting something with a bunch of features you’re going not going to use very often, or not at all. Normal scooters often come with a lot of accessories and functions that you don’t need while traveling. Therefore getting a simple and easy to use unit will not only save you weight but they are also more compact and for that sake easier to travel with. Whether you are going to be traveling around the globe, just taking the bus or going on a 24-hr cruise, getting a portable and lightweight mobility scooter is something you won’t regret. When we calculated the costs of renting a scooter on board a 24h cruise we came to the conclusion that: If you go on around 3-4 cruises per year then you would save money buying an additional travel mobility scooter instead of renting one each cruise. The Smartscoot weighs in at only 40 lbs making it one of the lightest in its category. It has an easy to operate folding system that lets you chunk it down into 3 pieces without the need for any tools. Fully disassembled the heaviest part weighs less than 27 lbs. When folded it fits perfectly in most cargo spaces such as on trains, buses and it even fits in the trunk of an N.Y.C taxi with giving the driver a headache. It is equipped with an FAA-approved battery which means that you should have no issues taking it onboard a plane. While traveling by air you can, most of the time, drive it through the checkpoint and all the way to the plane before you have to unseat and take it apart prior to loading. Some airlines like to take it at the check-in. If this is the case, they will give you a wheelchair and help you all the way to your seat on the plane. It was built with three key features branded into the minds of the designers, ease-of-use, comfort, and stability. Good stability has been achieved thanks to the adjustable back wheels which lets you widen the distance between the back wheels on command in order to create a more stable base. Another great feature with this scooter is that you can easily decrease the scooters width if you need to go into places with narrow door openings, or don’t feel that the extra stability is an issue. Comfort has been achieved by making everything highly adjustable so that you can adjust the steering column, seat, and backrest to best suit your body and posture. It is powered by a front wheel drive, built-in hub motor, and a high-quality lithium-ion battery that is weather proof and provides you with a maximum distance of 12 miles on a single charge. You can easily adjust the top speed of the scooter by choosing from one of the 3 preset speed modes. This is perfect for when you’re on a cruise ship or the airport, just hit the lowest mode and you won’t accidentally run anyone or anything over. Let us say you’re in the need for speed for some reason, hit the 3rd gear and get going at a top speed of up to 7 mph. The braking capacity of the Smartscoot is very good. It uses a front mounted disc brake, but in addition to the disc brake, it also utilizes a parking brake. You can be sure that when you need to park and get off, the scooter stands still. It is also equipped with a LED headlight for great visibility during nights and a horn which both makes traveling safer and easier by being able to warn people about your forthcoming. Portability, This means that it is small and considered easy to take with you almost everywhere. Lightweight, If you can lift a Pug (yes, the small dog breed), then you can easily load and unload the smartscoot. Airplane safe, You should have no problem using the smartscoot on your airplane travels. But always read up on your chosen airline to see if they have any special recommendations for handling. High top speed, The easy to use pre-set functions lets you choose from 3 different speed-modes so that you can comfortably set it to a speed that is consistent with the environment you are going to be riding in. Long reach, During traveling you never know how long you’d have to go until you can recharge your scooter again. Therefore, having more than enough distance to cover your daily needs is a must. Read our full review of the smartscoot here. The Zoome flex is a fairly new model from Drive Medical, who are the creators of one of the most popular mobility scooters as of today, the Scout. The new Zoome Flex is a lightweight scooter that comes equipped with one new and very useful feature, automatic folding. This makes it a great choice for travelers, no matter what your choice of transportation is the Zoome will handle it. If you go by car, the Zoome fits perfectly into most trunks and the automatic folding will help you get the scooter into its fully folded state within 15 seconds. The battery is airline approved so you can easily take the plane or train where you want to go. It has a good top speed of 4mph and a great range of up to 13 miles on a single charge. If you drive economically then you can expect the battery to last for 3-4 hours of consecutive driving before it’s empty. It works great on even surfaces and has puncture free tires so you don’t have to worry about getting a flat. You get two keys that ensure only you and those trusted by you can start the mobility scooter and one remote control that makes the folding process even easier. With the press of a single button, the whole scooter folds together in a very compact design weighing only 55 lbs with the battery detached. The battery weighs around 5 lbs and has a simple detaching system. What makes the Zoome good for adventurers? Automatic folding, You can’t have a travel scooter without having the constant need of folding it together. Whether it be for storing in a hotel room, in your home, on an airplane, or in the trunk of your car for a road trip. The folding system is used very frequently and having an automated folding system will eliminate the most annoying process with owning a mobility scooter. Lightweight, Even though they have implemented the automatic folding system on the Zoome flex it doesn’t weigh more than most other scooters. If you detach the battery the weight you’d have to carry into your car is only 55 lbs. Safe battery, With an airline approved battery you can be sure to not run into issues on the check in. It works great for other types of transportation too, like cruises and train where space might be an issue. Simple and easy, It is simple to use but with a good set of adjustments and features that are really useful. The folding makes it even easier to use and if you’re a one-man show then this is the scooter for you. Read the full Zoome flex review to know more about it. Those of you who have already rented a mobility scooter onboard a cruise ship know that it can be pretty expensive. The Go-Go Traveller is the exact scooter that you get to borrow while you riding the waves towards the horizon if you rented it through the cruise company. The Go-Go traveller is by far the most popular mobility device used by thousands of cruise enthusiasts all over the world. Heres the thing though, if you go on more than three cruises a year then you are better off buying your own then you are renting one. Because renting these devices doesn’t come cheap. If you ask us, we think that these high rent prices are wrong and that all cruises should be equipped with a set of mobility scooters to accommodate their passengers who suffer from a disability at no extra cost. However, the reality isn’t aligned with our passion for disabled people. Therefore we recommend that you skip renting one and just buy the damn thing instead, it’s not that big of a deal if you consider taking more than one cruise over the next couple of years. Consider that these work just as good in your home or going to the store as well. What makes the Go-Go Traveller such a good aid on boats is its compact size. You can easily navigate narrow corridors and get in and out of the handicap-friendly rooms with ease. Getting through the door openings might be a big problem if you were to use a larger scooter. This disability vehicle has a top speed of 4.5 mph, and with a full charge which will take you anywhere between 7-10 hours you can get up to 13.5 miles out of it. This should more than cover the needs of someone going on a cruise ship. The scooter can be assembled/disassembled in less than 60 seconds and the total unit weight is above 110 pounds. It splits into two pieces when disassembled (three if you count the battery), the heaviest part weighs around 40 pounds. Maneuverability, with both a 3- and a 4-wheeled choice you can simply choose between maneuverability or a more stable scooter. Both models are stable, but the 4-wheel does gain a bigger base which gives it increased stability and a bigger turning radius. The 3-wheeled model performs the other way around. Slick design, It is small in size making narrow turns or going through small door openings possible. Therefore it can get you in and out of most cruise-ship cabins with decently sized doors. Delta tiller, The delta tiller helps you navigate the scooter with ease. They are built for people with less upper body strength to be able to quickly and simply navigate the scooter through narrow places. Quality tested, As we told you earlier the Drive Medical Go-Go is the same scooter that cruise-ship companies tend to rent out to their disabled passengers. This means that the scooter has been tested multiple times on cruise ships, by multiple people. This ensures the quality of the ride and from what we’ve heard and read it is the most effective mobility scooter to accompany you on boats. Picking the right travel mobility scooter needs some further consideration. Just picking a lightweight versatile unit might work fine for the most part, but if you have a specific way of travel then you will be better off giving it some extra thought. Especially if you’re considering taking it on an airplane, then you need to make sure you know the rules and regulations to mobility scooters during air travels. Go through the pointers below in order to better understand what type of scooter might best fit your most frequently used transportation method. When going on cruise ships you want a compact mobility unit that is easy to use and has a compact folding system. Here our recommendations are that you go with the Go-Go Traveller elite or the elite plus. 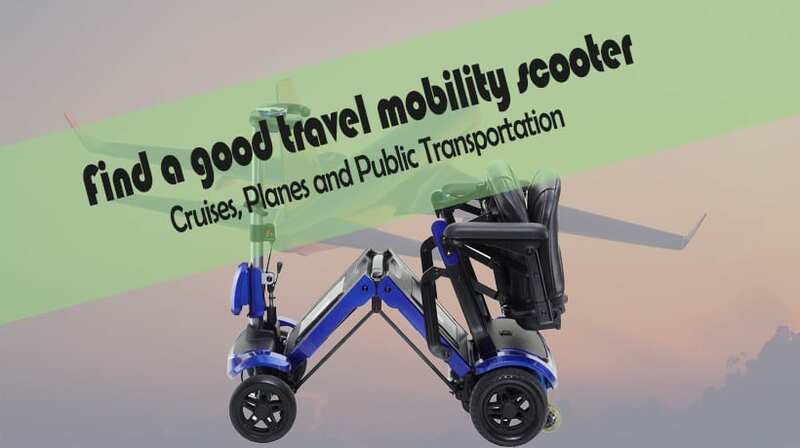 This mobility scooter has proven itself time and time again and is frequently seen across U.S cruise ships. They can be rented for the occasional cruise or purchased if you’re going on more than 3 cruises a year we highly recommend buying it instead. The main reasons why we like the traveller for these type of travels are its compact size, that it fits perfectly in disabled-friendly cabins, and that is easy to fold. Traveling by air can, at first sight, seem a bit difficult. Getting a mobility scooter that runs on lead-acid batteries will definitely give you an easier flight. Lead acid batteries have fewer rules when it comes to air travels. Lithium batteries, however, needs to be under 3000mAh in all battery cells combined. Otherwise, you won’t be allowed to check in your scooter. Most lithium batteries in mobility scooters are under this 3000 mAh limit, but not all. Lead acid batteries, however, have no limit to power as long as they are in a non-spillable containment. If we would recommend a good mobile device for air travel we would recommend the SmartScoot, even though it runs on a lithium battery, we know it was created with airline travels in mind and the battery is accepted by all airlines in its current state. For more information on how to travel with a mobility scooter, read our extensive guide to find out about rules, regulations and your rights according to the law. Public transportation is another popular way of transporting yourself and your mobility device. When using public transportation you want to be sure that the scooter is small enough to not only get you on the bus, train or subway, also to give you extra space to turn around on it and find a good place to sit while you ride. A good choice here is the Zoome Flex, this scooter has automatic folding which makes it a lot easier and it only takes about 15 seconds to fold/unfold. This way you can easily lift it on board or just ride the scooter onboard and then fold it together and find a normal seat for the ride, while your mobility scooter stands folded in a corner taking up minimal space on the transportation of your choice. All medical scooters are allowed on public transportation and there are laws written that make sure that all public transportation should be able to accommodate a disabled person. If you write down your needs and then pick a travel mobility scooter you will in most cases be much happier with your choice in the long run. Many disabled people have multiple scooters to aid them in different situations. For example, a heavy-duty mobility scooter might not be the best choice for air travels nor in your home as they are often much larger in size which makes them very clumsy. By now you should pretty much know what to look for in an electric mobility scooter. If you haven’t found the right one yet, just keep looking through our individual reviews because there are endless options for you to choose from and one of those might definitely be the perfect fit for you. My mother is in need of some extra mobility after her surgery. We are looking for something lightweight and easy to use. I like the features mentioned here that allow for easy folding as well. This would be nice for travel. Yeah, there are multiple lightweight units. If she is going to use it for a short period just after surgery I would suggest that you go for one of the cheaper models. They can be easily resold afterwards without a huge loss of money.